Every season the whole school takes a field trip. Last fall, we went to Maruyama Zoo; in winter, we went to the Sapporo Snow Festival. This week we had our spring field trip and went to Bankei, an outdoor recreation area in the mountains just outside the city. 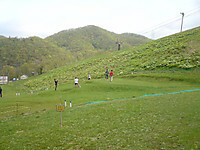 Bankei is a ski hill in winter and a park golf course when the snow is gone. I’d never seen park golf until I came to Japan, and this was my first time playing it. You have a wooden club and a light rubber ball that you smack across the grass to reach the hole. It feels like a bigger version of miniature golf. 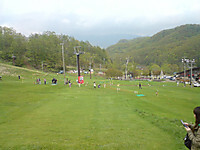 You have to hit the ball fairly hard, and walking around the course gives you a bit of exercise, too, so the game is mostly popular with older people, but even a lot of the students were getting tired towards the end. The game is actually harder than it looks -- especially if you’re playing on a giant slope -- but everyone seemed to be enjoying themselves. After about two hours of park golf, we stopped for lunch -- all-you-can-eat “Ghengis Khan” (again, not the Mongolian guy -- read my last post a little ways down if you’re confused). The weather was really nice, so we grilled outside and attracted all the local crows. Springtime in Japan means cherry blossoms, and when the cherry trees are blooming, it's “flower viewing” season. People get together and picnic beneath the cherry blossoms, although in reality most people ignore the flowers and focus on drinking, eating, and having a good time. 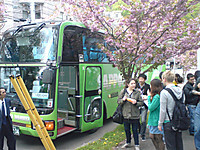 This weekend the school had its flower viewing picnic at Maruyama Park. 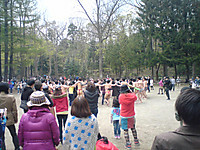 About sixty people came, including a lot of the teachers and teacher-training students. It was a little cold, so I didn't think many other people would be out, but the park was completely full of picnickers. 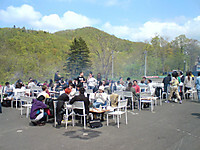 We rented some grills from a nearby restaurant to barbecue Japanese-style. If you come to Hokkaido, you'll see a lot of places advertising “Genghis Khan,” but it has nothing to do with the Mongolian conqueror – it's actually what people call grilled lamb or mutton. We grilled a lot of vegetables, yakisoba noodles, and Genghis Khan. 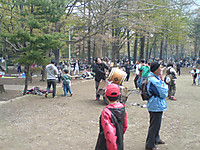 A little while after we arrived, a large procession of college-aged people came through, chanting and beating a Japanese drum. They gathered in the middle of the park and began dancing in a circle. 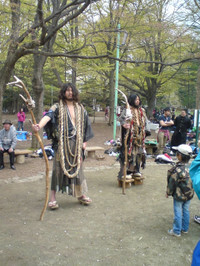 Some of them were wearing really unusual costumes (see the picture), and the men that were dancing were mostly in red loincloths. I had absolutely no idea why any of this was happening, but it was certainly entertaining. A lot of people were taking pictures, and a few brave ones even joined in the circle. From what the Japanese teacher training students said, they were some kind of club from Hokkaido University, but that was all anyone seemed to know. This past week was Golden Week, a string of four national holidays that give the usually busy Japanese workforce a chance to go on vacation. I don't like crowds, so I didn't do any traveling, but we had some nice spring weather, so I took a long walk out to Kotoni Hassamu River Park. 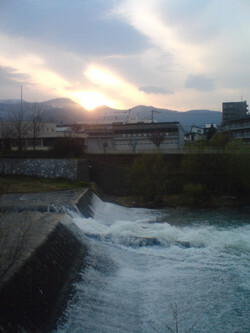 As the name implies, it's just a park along a river, but it's a nice, quiet place with a good view of the mountains. 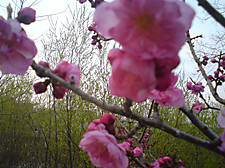 Nothing says spring in Japan like cherry blossoms, and along the river some of the cherry trees were starting to bloom. At least, I'm pretty sure they were cherry trees – there are a few different varieties, as well as some other kinds of flowering trees. At any rate, it's a lovely time of year. Golden Week creates a phenomenon known as “May sickness.” Schools and businesses start their new year in April, everyone works hard for a month, then they have this nice, long spring vacation, after which nobody can focus on work or study. It's definitely feeling like it will be that kind of a week.